Northern Indiana is a region of the U.S. State of Indiana, including 26 counties which border the states of Illinois, Michigan, and Ohio. Northern Indiana is also considered part of the Great Lakes Megalopolis. 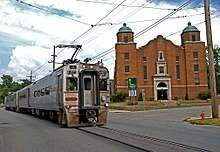 The area is generally classified into other sub-regions; Northwest Indiana (or the Calumet Region) is closely tied with Chicago economically, culturally, and politically and is part of the Chicago metropolitan area. The north central region (or Michiana) centers on South Bend metropolitan area, with economic connections to southwest Michigan. Northeast Indiana is centered on the Fort Wayne metropolitan area. 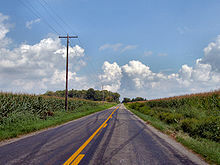 The Northern Indiana landscape is physically characterized by very flat to very rolling terrain, ranging from 600 to 1,000 feet (180 to 300 m) above sea level. Glacial kettle lakes are found throughout Northeast Indiana, with sand dunes sharing the Lake Michigan shoreline with heavy industry in the northwest. Kosciusko County is home to the largest natural lake (Wawasee) and deepest natural lake (Tippecanoe) in the state of Indiana. The Eastern Continental Divide runs through the region following the top of the Valparaiso Moraine. Besides a few urban areas, much of Northern Indiana lies in the agricultural Corn Belt. The following counties are the Northwest Indiana counties that are part of the Chicago metropolitan area. Much of this area in Indiana is known as the Calumet Region. The major cities of Northern Indiana are Fort Wayne (in the northeast), South Bend (in the north central region), and Hammond and Gary located in the extreme northwest along Lake Michigan. Northern Indiana has seen a steady population growth over the past century with the exception of 1990. Between 1980 and 1990, Lake County (which includes the city of Gary) saw a population decline of 47,371 residents, and it was this drop in population that hid the population rise which continued to occur in the majority of the region's other counties. The 2015 Census Estimate has shown that the rural counties (i.e., Wabash and Wells) are seeing a gradual population decline; when compared to the gradual increase (or steady) population trend in the more urban counties (i.e., St. Joseph). The trend of rural counties losing population has been observed in various counties in other regions, most notably the Great Plains. The Inland North dialect of American English is mostly found in the Calumet region of Northern Indiana. The Northern cities vowel shift is recognizable in Northwest Indiana and the Michiana area. However, the rest of Northern Indiana tends to exhibit North Midland dialect, with little recognizable influences. Because of the city's transitional location between the Inland North, North Midland, and Central Midland dialects, Fort Wayne has been difficult for linguists to define, with some labeling speech here "virtually accent neutral," attributed to historical settlement patterns. The Calumet region observes Central Time, including Jasper, Lake, La Porte, Newton, Porter, and Starke counties. The rest of Northern Indiana observes Eastern Time. U.S. Steel's Gary Works mills in 1973. Northern Indiana bases much of its economy around manufacturing, distribution and transportation, and medical devices. Outside the metropolitan areas, the region's agricultural sector is abundant, given its location within the Corn Belt. Despite the region's storied history in industry, Northern Indiana is also at the heart of the Rust Belt, an area of the U.S. that has suffered deindustrialization and some economic stagnation since the late-20th century. Located on Lake Michigan in Portage, the Port of Indiana–Burns Harbor. Corn fields in Marshall County—a common scene in rural Northern Indiana. Wind farms dot the landscape in Benton County. The Calumet region of Northwest Indiana is home to much heavy industry, notably steel mills. The Calumet region is the nation's second-largest steel producing area. U.S. Steel's Gary Works (in Gary) was once the largest steel mill in the world and employed 30,000. Gary Works remains the largest integrated steel mill in North America. Operated by BP, the Whiting Refinery (in Whiting) is the fifth-largest oil refinery in the nation, processing 405,000 barrels (64,400 m3) of crude oil daily. Northwest Indiana is also a vital trade and shipping center for the state. The Port of Indiana–Burns Harbor handles more ocean-going cargo than any other Great Lakes port in the U.S. Gambling is another important component to the Calumet region's economy, with five riverboat casinos on Lake Michigan (Ameristar, Blue Chip, Horseshoe, Majestic Star, and Majestic Star II). The north central area of Northern Indiana, centered on Warsaw, is home to several companies specializing in the development and production of orthopaedic medical devices. Nearly one-third of the $38 billion global orthopaedic industry is concentrated in north central Indiana. Elkhart and surrounding municipalities in the Michiana region are home to the largest concentration of recreational vehicle and mobile home manufacturers in the U.S., including Forest River, Gulfstream Coach, Heartland Recreational Vehicles, Jayco, and Monaco Coach, among several others. 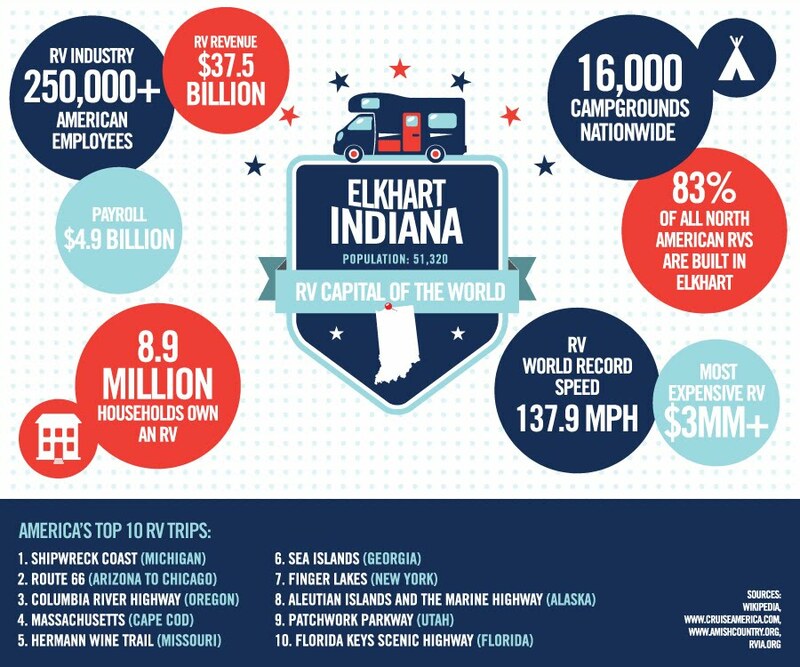 Some 83 percent of American RVs are produced in Elkhart County. Benton County is home to several wind farms, including the Benton County Wind Farm, Hoosier Wind Farm, Meadow Lake Wind Farm, and Fowler Ridge Wind Farm, the largest of its kind in the American Midwest and twelfth largest in the world. The private Roman Catholic University of Notre Dame is located in the Michiana sub-region of Northern Indiana. 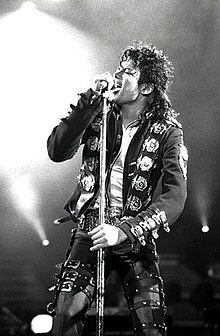 Michael Jackson, arguably the most recognized Northern Indiana native. Wikivoyage has a travel guide for Northern Indiana. ^ "The Twelve Largest Amish Settlements". Young Center for Anabaptist and Pietist Studies, Elizabethtown College. 2008. Retrieved 2013-10-25. ^ "US Census QuickFacts". Retrieved June 24, 2016. ^ United States Census Bureau. "Census of Population and Housing". Retrieved June 24, 2016. ^ "American English Dialects". Retrieved 2013-10-26. ^ Devon Haynie (2009-03-15). "Hoosier dialects difficult to define". The Journal Gazette. Retrieved 2013-10-26. ^ The Times of Northwest Indiana (2012-01-03). "U.S. steel production up nearly 8 percent in 2011". Retrieved 2013-10-25. ^ Catlin 1995, p. 90. ^ NiSource, Inc. (1999-10-14). "U.S. Steel - Primary Energy Cogeneration Plant at Gary Works Wins National Recognition". Retrieved 2013-10-25. ^ BP. "Whiting Refinery Facility Fact Sheet" (PDF). Retrieved 2013-10-25. ^ Ports of Indiana. "Burns Harbor Executive Summary". Retrieved 2013-10-25. ^ Grace College and Seminary. "Orthopaedic Regulatory and Clinical Affairs (ORCA)". Retrieved 2013-10-25. ^ Roadshow for Growth and Holly Allen (2013-05-24). "Infographic: Meet the RV Capital of the World". Retrieved 2013-10-25. ^ "Midwest's Largest Wind Farm Online in Indiana". Grow Indiana Media Ventures. 2009-04-15. Archived from the original on 2011-11-04. Retrieved 2013-10-25. This page was last edited on 15 February 2019, at 23:20 (UTC).